Bake sugar cookie mix according to package directions. Roll the cookies into heart shapes, if desired, before baking. In a small bowl, mix together yogurt and whipped topping. Spread a thin layer of yogurt mixture over cooled cookies. Top with a rainbow of fruits. Perhaps one of the finest miracles in life is that fruits come in a variety of rainbow colored hues. No food coloring needed, no unnatural dyes or chemicals, just pure reds and oranges and blues and purples. For our wedding, my husband and I were on a big-time budget. I think we had to pull the whole thing off for a thousand dollars, and that included buying my wedding dress. So, times were tight, and I remember telling my aunt that I was just planning on serving our wedding cake at the wedding. "Goodness, no!" she cried, "it's your WEDDING -- you've got to serve something splendid." And so, we spent the afternoon conjuring ideas that equaled splendid, without breaking the bank. 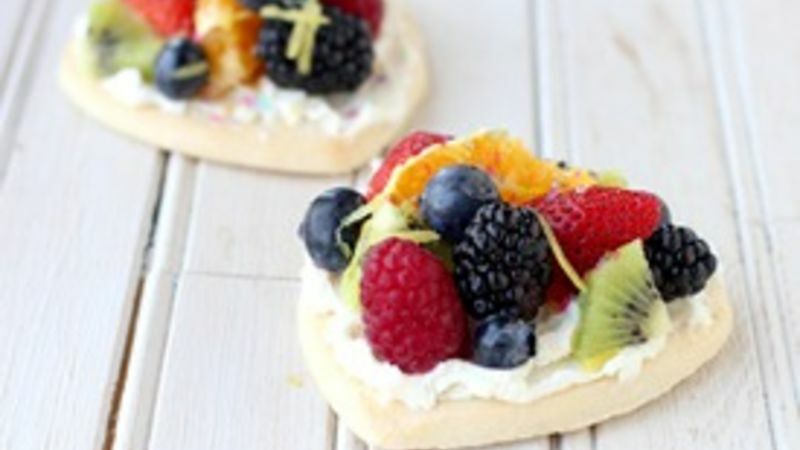 It didn't take long for us to decide that Mini Rainbow Fruit Pizzas were both adorable and affordable. They were a simple, eye-catching dessert and lent a perfectly light touch to the wedding day. It was a splendid way to celebrate ... much, much better than tossing out dishes of ordinary wedding cake. Every summer since then, I find myself in dire need of a recipe that serves a crowd while wowing their tastebuds. This rainbow fruit pizza always fits the bill. It's easy, bright, and totally rainbow-tastic. No artificial dyes involved. Here are a few more personal-sized dessert recipes to wow your guests!